A family is sitting around at home. The father-in-law feels that the others look bored, so suggests a trip to Abilene, Texas. No-one wants to go, they’re tired, the journey is long and it’s too hot to be stuck in the car. Besides, there isn’t much to do in Abilene. Despite this, they all agree to go, because each thinks the others want to. We can see the Abilene paradox at play in British politics, where putative socialists support the anti-socialist/reformist Labour Party with the vague idea that the working class in general do – despite the poorest third of the population not even participating in General Elections. You’d be hard pressed to find a left organisation in Britain who doesn’t tail the Labour Party. The message of these parties range from: ‘vote Labour’ to ‘we have no choice but to vote Labour’. In the latter category, we have groups who consider themselves outright Marxist/socialist/communist as opposed to being social democratic. What is even the point of having a separate organisation if all you ever do is tell people to support a bigger, supposedly antithetical one? Usually, the justification is that we have to just go with what everyone else wants, where the workers or public are, and there is no other option. But this puts the cart before the horse. They think people support Labour because there’s no alternative, in reality there is no alternative because so many support Labour. If everyone who doesn’t support communist organisations because they’re ‘too small’ just went ahead and supported them, guess what… They Would No Longer Be Too Small. They don’t need to be huge either, a small group of committed communists will always punch above their weight and do more good than however many millions they ever get to support the Labour merrygoround. As Lenin said, ‘better fewer, but better’. Yet all Labour does is direct opposition and energy into bolstering institutions that need to be overthrown – they’re selling the idea that electing them is the only solution. 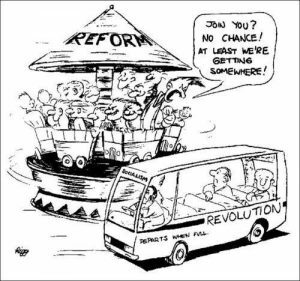 And those who refuse to join a new movement accuse those trying to build one of pointlessness and futility. They even boast about the sacrifice of their own principles to a futile project and accuse us of nihilism and purism – while insisting there is no possibility of real change – projecting their own shortcomings upon us. For these liberals, revolution is unnecessary, impossible or inadvisable. Classes can all get along and a kind of ‘capitalist socialism’ can be achieved with a few placatory words, an arm round the shoulder, and a bit of persistence. It’s this nihilism we need to oppose. What a lot of people forget, when they try to dismiss communist groups in the imperial core as impotent and futile, is that they are part of a global movement (where in countries like India and the Philippines they pose a genuine threat to the bourgeoisie) and continue a historical tradition (more than 30 successful revolutions). They forget that being a thorn in the side of imperialists at the core means they punch above their weight and provide precious breathing space for liberation movements around the world. One communist activist in the core is worth a thousand Labour/Green/Democrat party lackeys who only buttress false hope and castles in the sky. They choose to ignore the fact that communists have provided the *only* alternative to capitalism. An economic system is either in the service of the bourgeoisie or the working class: and however ‘reformed’ capitalism is, it will always serve to maintain bourgeois class rule and keep the working class exploited. Still, these liberals can’t help themselves clutching at the faintest chance to save capitalism from itself. So why do certain socialists (broadly defined) refuse to acknowledge what is staring them in the face? Number one, in my opinion, is that they’re choosing what they think is the easier option. Ultimately it’s not easier, because it doesn’t work. But it’s passive, and that’s what is more important to them. It’s simpler to put a tick in a box every once in a while, inanely chant ‘oh Jeremy Corbyn’ and share ‘absolute boy’ memes on Facebook than face reality. It seems like less effort than doing genuine political work to help build a new movement that has a chance of achieving tangible change. Secondly, it’s safer. They can remain within their comfort zone and not have to justify themselves to peers and authorities that might look askance at radical politics. And thirdly, it’s a ready source of social capital. This applies in particular to writers and activists who have ambitions within the system. It’s easier to get writing gigs and official positions as a leftist if you support the Labour Party than if you oppose it. And of course, the convenience of supporting Labour for these people tends to rest on a certain amount of economic comfort. 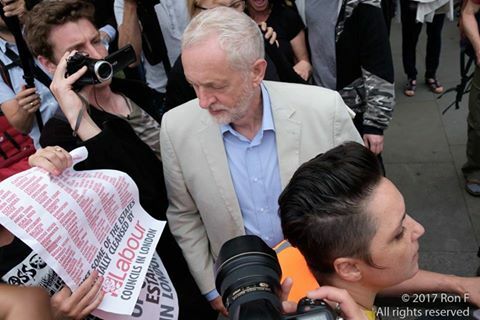 Labour-apologists point to the holding of party membership and ticking the Labour box on election day as proof that Corbyn is driving a movement – yet fail to see that this is a substitute for effective political action. The main justification behind this espoused by Corbynites is that there’s some kind of mass movement behind Corbyn, and therefore we should reinforce their illusions because, well… I dunno, it kind of loses me there really. Why should we foster illusions among the working class? I don’t get it. Surely, being honest and truthful with those we seek to educate and develop solidarity with is more advisable than trying to reinforce false ideas that will inevitably be exposed at some point. I think the argument is based on the false assumption that Momentum is populated by salt-o’-the-earth proles, when in fact it’s just your same old middle class lefties and liberals ‘doing their bit’. It isn’t populated by the heart of the working class because they are too busy suffering attacks by their local Labour councils. In 2015 70% of Labour members were in ABC1 social group, under Corbyn’s leadership this had increased to 77% by July 2017, with an average age of 53. Hardly the socialist ‘youthquake’ it’s made out to be. Furthermore, Momentum was launched by the likes of Clive Lewis, who thinks that Nato is a ‘socialist construct’. The party’s membership may have doubled to over half a million, but this has not translated into putting a dent in austerity or war. The opposite, in fact, as would-be resistance is defanged and converted from a potentially potent movement into a cult of ‘ohh Jeremy Corbyn’ chanters and Labour vote canvassers. Meanwhile, Labour councils have attacked bin workers on strike in Birmingham, Teaching Assistants in Durham, school caretakers on strike in Glasgow, and rough sleepers in Bristol, Hull, Leeds and Manchester. The Corbynite Brighton and Hove council attacked a homeless encampment next to a church! Remember, attacking is the opposite of solidarity. Moreover, a Labour council fought over a decade-long battle in Glasgow to stop women workers getting equal pay. Elsewhere, we get Labour indifference and lack of solidarity, while they get on with the more important job of canvassing for votes. This is not to say there isn’t a significant working class membership or support for the party, and there are, of course, Labour members and supporters who genuinely want change. And this is the point: the likes of Corbyn divert such people into unthreatening forms of politics. The fact that the right-wing media and the right of the party (virtually all the PLP) attack Corbyn so viciously is taken as proof that he is a threat. But Corbyn does not represent an existential threat to the ruling class – he wants to collaborate with them. The problem for them, however, is that they will not brook even the slightest deviation from their class war campaign. A slight deviation is all Corbyn represents, and they attack him to ensure his ultimate compliance when/if he becomes Prime Minister. Corbyn is not the driving force of a new movement, he is the cork that contains it.